Coorparoo Fusion Delight uses their own specialised couriers to deliver their food. A mouthwatering appetizer, tantalizing fried potato cutlets are spiced up with garam masala, coriander powder. Served with date and tamarind sauce. Camembert wedges in a crispy fennel,ginger & fresh coriander tempura style batter. Boneless chicken breast pieces marinated in yoghurt and with the traditional spice mixture . W hole chicken marinated in yoghurt and with the traditional spice mixture tandoori masala & grilled. Flavoured with fennel, thyme, black pepper and mustard. GLOBAL INDIAN FAVOURITE - spinach, tomato, onion, garlic, onions & fresh herbs. Beautiful curry originating from the coastal area of Indian, meat simmered in mildly spice coconut milk and tamarind sauce. GLOBAL INDIAN FAVOURITE - creamy yellow sweet, mild onion & almond sauce. A delicious curry from South of India prepared with coconut milk, tomato, onion, fresh herbs & spices. GLOBAL INDIAN FAVOURITE - made with fried onions, ground spices and tomato. GLOBAL INDIAN FAVOURITE . Diced chicken breast cooked in creamy tomato, ginger & almond sauce. GLOBAL INDIAN FAVOURITE . Diced chicken breast cooked in tomato, ginger & almond sauce with diced onions, capsicum & herbs. Methicham an is a superb chicken dish cooked in a cream y sauce with fenugreek leaves and traditional spices to give it a strong curry flavour. Chicken breast cooked with Fusion house spices and cream y smooth mango gravy. Lamb cooked in cream y tomato, ginger & almond sauce. Chicken with bones marinated in Nepalese herbs & spices, flavoured with timur, fenugreek seeds & shallow fried. This slow cooked lam b shanks recipe is given fragrance by an infusion of Indian spices. Goat meat with bones marinated in herbs & spices, flavoured with black pepper & shallow fried. Lamb kofta with Cashewnut & secret spices. Grilled eggplant folded & filled with sultana, almond served with smooth gravy. Lamb stewed in gravy of spicy mince, soaked with rare spices, rara gosht's every bite regal in taste and appearance. Cooked in onions, chiilli, tomato, capsicum & cumin sauce. Beautiful curry originating from the coastal area of India, meat simmered in mildly spice coconut milk and tamarind sauce. Cottage cheese cubes in a rich tomato, almond & creamy sauce. Succulent fried chicken breast infused with Indian herbs and spices topped with desiccated coconut. Nepalese spiced grilled chicken / lam b served with tom ato, onion, ginger & garlic. Traditional tempered dahl with garlic, chilies, onions, tomatoes, mustard seeds, spinach and seasonal vegetables. Dal cooked in a rich tomato, almond and creamy ginger sauce. Mouth watering boneless chicken mixed with red chilli, onion, capsicum and soy sauce. Prawn tossed with red chilli, fresh garlic, onion, capsicum and soy sauce. Potato fries with Mexican seasoning served with ranch sauce. Avocado blended with salad onions, coriander, lime, and Mexican spices served with corn chips. Corn chips, cheese, pico de gallo, sour cream, black beans, corn salsa, roasted tomato salsa and guacamole. Crisp corn chips, cheese, pico de gallo, black beans, sour cream . mashed tomato salsa, sour cream , roasted tomato salsa, corn salsa, and guacamole. Nachos topped with chipotle, black beans, globs of m elted cheese, pico de gallo, sour cream , roasted tom ato salsa, corn salsa and guacamole. Oven baked tortilla wrap filled with rice, refried beans, lettuce, roasted tomato salsa, pico de gallo, sour cream sauce and cheese. Oven baked tortilla wrap filled with rice, black beans, lettuce, roasted salsa, corn salsa and guacamole. In a bowl without the tortilla, with black beans, crisp lettuce, roasted tomato salsa, corn salsa pico de gallo, sour cream, and cheese. Oven baked tortills wrap filled with rice, pico de gallo, corn salsa, black beans, lettuce, and cheese. 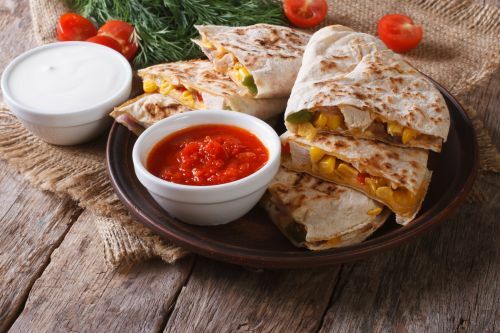 Grilled tortilla wrapped with cheese and your choice of meat fillings served with sour cream, roasted tomato, capsicum and corn salsa. Tortilla wrap with melted cheese, roasted tomato, lettuce, corn salsa, pico de gallo and choice of your meat. Freshly crumbed barra fish and beer battered chips served with ranch sauce. Flash fried folded flour tortilla topped with melted cheese, pico de gallo, sour cream, guacamole, served with salad, filled with Mexican rice, black beans and your choice of meat, sour cream, roasted tomato, capsicum and corn salsa. Y U M M Y! Pan tossed grilled chicken or beef with onion and capsicum, served with black beans, guacamole, sour cream and three tortilla.